The best of Italy - a week in historic Rome, then relax by the sea in Amalfi! One week each in personally selected apartments in Rome and Amalfi. Airport transfer assistance upon arrival and departure. Rome: Transit pass good for unlimited rides on Rome’s extensive system of buses, trams, and metro. Amalfi Coast: Regional bus pass good for the coastal bus that runs between Sorrento and Salerno, connecting the towns in between. 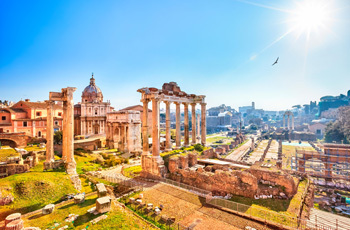 Transport between destinations: 1st class rail ticket from Rome to Naples, with private driver transfers between apartment and rail station on either end. Local info and Untouring Rome and Untouring the Amalfi Coast guidebooks, researched and written by Untours staff, full of insider tips and sightseeing suggestions. Cultural events in each location, like a dinner and castle tour in Rome and a walking tour in Amalfi.